You probably searched “pingdom alerts in hipchat” or “pingdom hipchat integration” and were unhappy to find that there’s no direct method to integrate the two services. I was too - but it gave me the chance to use the AWS API Gateway and AWS Lambda to connect the two services. I assume you’re relatively familiar with the functionality that API Gateway and Lambda provide as well as getting-started experience with Node.js. The documentation on the Pingdom site describes how to find the webhook payload structure, so I followed their advice and observed the up & down webhook events. I don’t use it this demo, but each of the webhooks a X-Request-Id header was sent with a value like 6645779c-18a9-473d-808e-2b74450c7347. You may find this useful for tracing purposes. 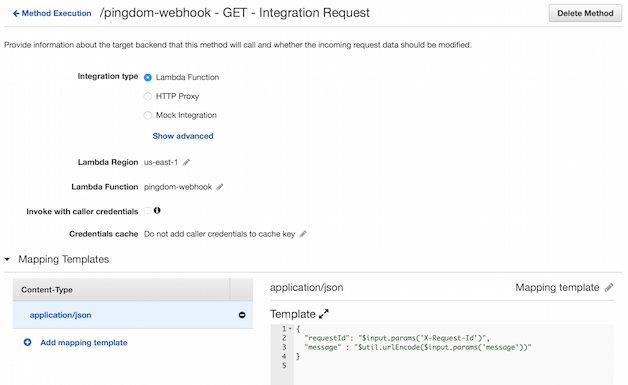 As you can see, the assign webhook is a GET request with the message payload as an URI encoded json string. It would be nice if this was a POST, but ¯\_(ツ)_/¯. 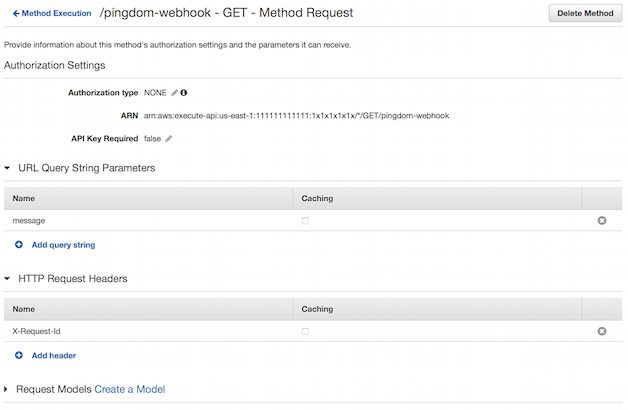 Now that we understand Pingdom’s webhook a bit better, let’s have a look at the AWS parts. Before we configure the API Gateway, let’s have a look at the Lambda function. We do this first because you’ll need to select the Lambda when you create the API Gateway resource. I chose to use Node.js, but the code is straightforward and should be able to be ported to python easily. When creating a Lambda function you’ll be prompted to select a blueprint. Any will do, but microservice-http-endpoint will most closely mirror the functionality of our Lambda. With a blueprint selected, you’ll need to configure the name, runtime, handler (entry point), IAM role, memory, and timeout for the Lambda. You will likely need to create a basic IAM role to allow your Lambda (the AWS console will help you do this), and you’ll want to decrease the memory requirement to 128MB. On line 11 event.message is decoded and then cleaned further to compensate for the remaining encoding weirdness. Once I figured out how to translate the querystring params in API Gateway, iterating on this was the last bit of magic to get a json representation of the Pingdom alert in the Lambda function. The rest of the code creates the HipChat notification API request & payload, and then sends the request. Lastly, if you want to be able to copy/paste this code into the AWS Lambda console for testing you’ll need to remove the config.js require on line 4 and replace the two values on line 27 with your HipChat token and room id. More on finding these values for your setup below. Now that we have the Lambda squared away, let’s see how it gets wired up with the API Gateway. The API Gateway takes the Pingdom GET request and populates the event object passed to the Lambda. This step would be much easier if the Pingdom webhook used POST instead of GET, but you’ll learn something interesting about the API Gateway as a result. Inside the API Gateway console create a new API, create a resource, and create a GET method. When creating the method, you’ll need to select “Lambda Function” as the integration type the region the Lambda function is deployed into, and the Lambda name (which will auto-complete). The API Gateway method before configuration. The API Gateway method request configuration. The API Gateway method integration request configuration. Header parameters and query string parameters are both fetched via the "$input.params('key')" function. Due to the encoding of the Pingdom webhook, we need to urlEncode the message value to avoid a parse exception. Once all this is configured, you’ll need to “Deploy API”. Stages are used as environments, so you can test API changes as they roll from development to production. If you make changes you’ll need to redeploy the API. Assuming your production environment is prod, you’ll receive a url like https://1x1x1x1x1x.execute-api.us-east-1.amazonaws.com/prod/pingdom-webhook. HipChat’s v2 API requires you to create an integration to push notifications to rooms. This is done via the HipChat admin console and creates an authentication token for the room id specified. You can find more detail about how to package multiple files for upload to a Lambda function in the README. What you should see in HipChat if everything goes well. In Pingdom you’ll need to go into Alerting > Alerting Endpoints and add a webhook contact method to an Alerting Endpoint used by an Alert Policy that is used by the check you’d like to see in HipChat. You likely already have an Alert Policy used for your check, so adding an additional endpoint for that policy should be straightforward. I hope this works for you, and please let me know if it doesn’t! Big thanks to @ripienaar for his post on translating webhooks that got me thinking about this in the first place.